The rock duo has become the norm while in the early 2000s it was considered revolutionary. But when something becomes the norm, how does an artist keep it from becoming a cliche? Give a listen to Tango, the new album from the Oakland, California, act Steel Cranes that’s due out on August 5, and you’ll get an answer. Melding post-punk and rootsy blues together with a dose of fuzz, Tracy Shapiro and Amanda Schukle resonate a badass vibe with each song they play. Tango is a record adorned with dark tones and subtle rhythms. 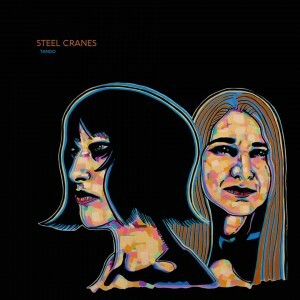 Recorded, produced and mixed by the band themselves in a purely DIY effort, Steel Cranes’ new record brings an interesting array of elements. A few tracks bring this gothic vibe reminiscent of acts like Rasputina, while others are purely badass blues punk bangers like The Jon Spencer Blues Explosion, but with a completely different kind of swagger. Tango‘s intensity and vigor never wears thin. It’s pristine on multiple levels and the senses will be hit like a wrecking ball through a brick building. Shapiro and Schukle know how to strike a nerve with their music. There’s something special about a band that has their hands in multiple pots. An act can gravitate more to the listener when they go beyond their boundaries. It offers a sense of intrigue that a band that sounds the same with every song can’t reach. That’s what Steel Cranes have going on with their new album. Let’s do the “Tango” and dance around my top tracks off of the Album Of The Week. Starting out soft and then turning into a triumphant anthem, “Today Is The Day” ups the ante with spine-tingling riffs from Shapiro and crushing beats from Schuckle on drums. “Take Me Down” begins as if it’s going to be a rockabilly country song and then it progresses to being a droning and dark violin-tinged track. Halfway through, Shapiro absolutely shreds on guitar to ensure an abundance of melted brains. Spaced out but in a good way, “Happy” gets a tad bluesy and a bit sultry. The rhythms and chords hit pretty hard with this one, so hold on to your seat when the fills occur. Starting next month, Steel Cranes will embark on a tour in support of Tango starting at The Flycatcher in Tucson, Arizona, on August 4 and ending at The Root Note in La Crosse, Wisconsin on September 2. Let’s hope the magnificent duo of Shapiro and Schukle venture through New England soon, but until then grab a copy of Tango when it comes out on August 5. It puts you in touch with your mean side and never wants you to change. Previous post: Gotta Catch Em’ All! Next post: The Roots Report: Stop the Violence!